In 1993 the Food and Drug Administration (FDA) implemented the Nutrition Facts label for packaged foods. It was a major shift in the grocery shopping experience. Now, a consumer could know what was in the food they were purchasing. Subsequently, nutrition professionals spent the next 20 years explaining why it is important to read the label, what the things on the label mean, and how to take the label seriously but at the same time not be overwhelmed. If America was not calorie-centric before, it will be now. The total number of kilocalories is huge. I think it may be larger than the heading or at least close to it. And, of course, it’s bolded. The percentage of your diet that each constituent makes up, if you consume 2,000 kilocalories per day, is now prominently on the left of each line item. In a left to right reading culture, this elevates the status of the daily value. Oh yeah, and now carbohydrates are officially carbs…so hip. Will these design tactics change behavior? I have my reservations despite explanations to the contrary. Serving sizes would also see an update, and represent the “typical” size vs what “should” be consumed. This provides a dollop of practical and a smidgeon of horror. Often the “suggested” serving size is too outrageously small or only used to take advantage of the measurement novice, and let’s face it – people are going to eat more anyway. However, take, for example, soda which the FDA website provides as an example. Both a 12 ounce can and a 20 ounce bottle provide one serving. This would be an outstanding way to really confuse a group of third-graders. Children, if you have 60 ounces of soda, how many servings do you have? If you answered 3 or 5, you’d be correct, depending on which container it comes in. It reminds us of those pictures we’ve seen of “1” cup of coffee or “1” glass of wine that is the size of an infant’s bassinette. Regardless, as clinicians we are keen to the fact that sometimes the serving size is the only thing between a poor choice and new potato chip manicure. That reasonable serving size appears to be a thing of the past, important only to our history since law requires the change. 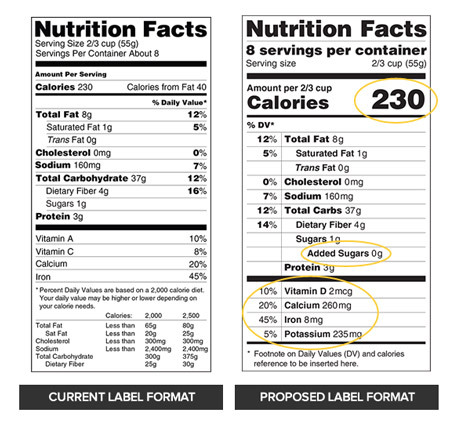 One caveat is that the larger serving packages will be required to have a “dual column box.” That is, one column for a typical serving and one column for the whole package. Added sugar is now a line item. This is perhaps the only thing I’m moderately excited about. Added sugar is a complicating factor in normal and abnormal health status. What’s encouraging is that now that this is prevalent, maybe institutions like hospitals and schools will pay particular attention to added sugar. When we suggest a no- or limited-added sugar diet, patients can no longer bemoan that “added sugar is everywhere, hidden, and unavoidable.” Score one for health. Dietary cholesterol and saturated fat however, are here to stay another 20 years, despite the evidence, as the unofficial Mr. Yuk symbols of the 21st century. We lose the calories from fat which is a positive move since grams are already listed and fat calories seem to be less important that we once thought. Vitamin D is in and vitamin C is out. Vitamin A is out and potassium is in. Calcium and iron maintain their rank and are both included in the new label. The bottom line is that the nutrition facts label, present, redesigned or not, reflects only store-purchased, packaged foods. Restaurant food does not contain the Nutrition Facts label, with the exception of a few fast food establishments. With nearly half of all money being spent on food being spent dining out it’s a big miss for our patients.1 However, it hasn’t gone unnoticed and restaurants will have a cousin to the Nutrition Fact label. Those regulations proposed by the FDA in April of 2011 have yet to be finalized. With the idea that public health, specifically nutrition, is about small bits of usable information, I may be surprised by the impact. Will this redesign improve the health of our nation or simply confuse the public for another couple of decades? Only time will tell. Dr. Schuler is both a locally and nationally recognized expert in the field of natural health and metabolism. He is a frequently sought out expert teaching to physicians and other healthcare providers, often interviewed for radio and magazines, and consulted by leaders in the industry. He has been a featured guest of Rochester General Hospital (New York), Primal Diet Modern Health, Doctor Health Radio, Let’s Get Healthy with Bill Swail, Good News Health Show, Healthy Choices, Elevate Your Energy, Underground Wellness, and Five to Thrive Live as well as Men’s Fitness and Strategy magazines. Dr. Schuler’s face may be familiar from the national airing of the MyPillow and MyPillow Premium 30 minute television commercials.